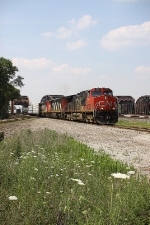 Description: CN grain train waiting for a crew to head South on to the CN/IC. 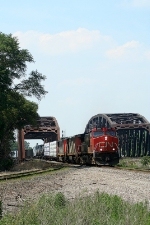 Description: BNSF Yard Limits - Beardstown Sub. - Time for a little snowball fight. Description: CN Train G86491-19 (Loaded Unit Grain Train) heads east towards Peosta, IA on its way to East Dubuque, IL where it will be handed over to the BNSF. Description: The outbound crew of CN train Q194 with new power and their Jackson pickup. Description: Probably the closest I well get to a train at the spot in the previous photo. This is parked about 5 miles north at Mellen. I heard this train go by about 25 miles south around midnight, as I lay in bed in my cabin. Description: Several days later, 2702 is back parked at Mellen, this time heading north. Description: CN 2702 parked at Mellen.